It's about time there was a thread on this subject. OK, so I'm probably the only one who'll ever say anything on the subject but just indulge me, eh..? It's about women's sport. That's all. Please don't try to make it about men. If you want to talk about men's sport please start your own thread. Week one of this year's 6 Nations tournament which, in effect, is the Northern Hemisphere rugby Championship, kicked off last night in Dublin. England were always going to be hot favourites against Ireland. The England women's team turned professional last year, financed by the RFU and their own television and sponsorship deals. The squad has clearly benefited from being able to train and practice full time. A game and gallant, but still amateur, Irish team were never able to cope with England's pace, power and precision. 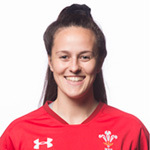 Jess Breach, Katie Daley-McLean and Zoe Harrison scored three tries in the first 13 minutes and effectively the game was over. 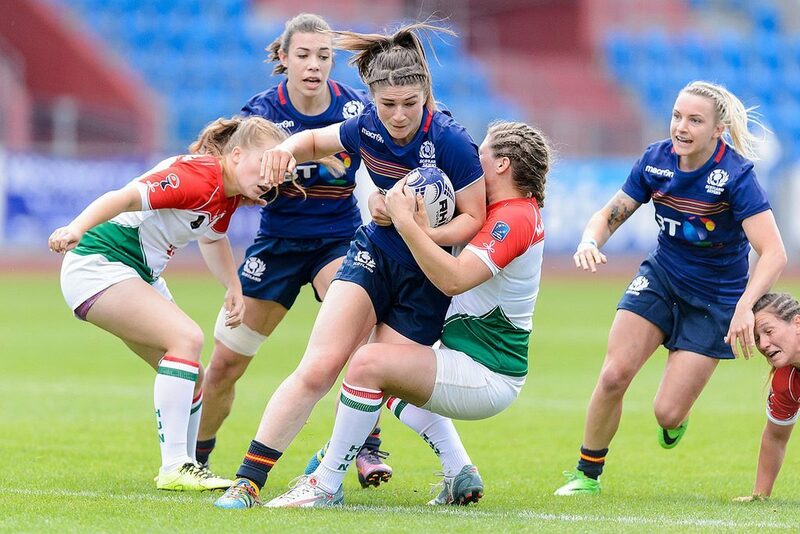 The Irish girls fought hard and did themselves credit with their commitment but the 51-7 final score was, it has to be said, a fair reflection of the difference between the teams. Italy impressed everybody today, beating Scotland by 28-7 in Scotstoun. 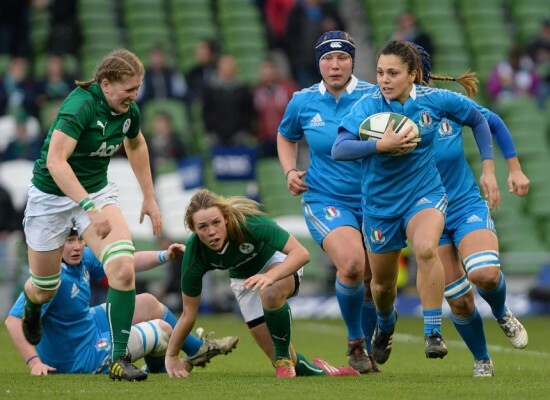 Ilaria Arrighetti put The Azzuri ahead early, but Scotland responded through Sarah Bonar while Italy were down to 13 for two yellow card offences. Tut-tut... naughty girls. The second half got off to a slow start but Giada Franco crossed for Italy, before Beatrice Rigoni and Elisa Giordano added late efforts. France host Wales at 8pm tonight in Montpelier. We're going out so will miss it. My money's on France to win this one. 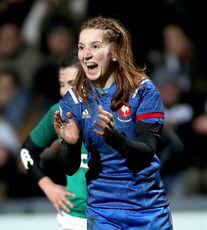 The French women have been professional for three seasons now and are reigning champions in the Women's 6N. Dhia Traore plays at Loosehead Prop but don't let that fool ya. That girl is FAST out of the blocks. Fly Half Pauline Bourdon is a very astute fulcrum for a team that has a lot of attacking options at its disposal. Les Bleus will be tough to depose as reigning champions. The match between England and France next week will probably be the deciding game in the tournament. Winner takes all..? Perhaps. I heard that skier chick just retired. Which one...? Surely not Mikaela Schffrin..? I have heard nothing on this. The last major retirement in women's ski racing was Tina Maze of Slovenia, who really pee'd on Mikky Schiffrin's Olympics last year. She decided it was time to quit the slopes to start a family, but I can't think of anybody since then. Perhaps Frida Hansdotter from Sweden might be thinking about it... she's in her thirties now and not having much of a season. She hasn't done much since winning the Slalom gold medal at the winter olympics. Perhaps she's decided to call it a day. That'd be a shame, because she's really talented and would surely regain her form sooner or later. Awwww, shame. I like her. My apologies for having a lack of knowledge concerning Rugby. I will inform you of some of the MMA fighters I enjoy seeing. I used to like Rhonda Rousey, but now I enjoy Jessica Eye and Megan Anderson. I tried to watched rugby a couple of times, when i was younger on public television look more like soccer than football. because the players less requirements on them than American football. it was ok to watch, not that interesting. I rather watch soccer than rugby any day of the week. tonight, I watched the last 20 minutes of super bowl, I knew that history of the rams, they were going to lose. I haven't seen a ram game, since they left st. louis. I stopped see movies on sundays, because the rams were soo bad, better watch them lose in a game than go to a movie. the rams were funny as hell to watch back then. I know from my experience with this sad excuse of a team. this team get cocky and too overconfidence in the last 30 minutes in any game. they were going to lose. I told myself in the first 5 minutes that rams will lose by interception and blow a field goal. the rams are predictable with trace record shows badly in the past, it will not to happen tonight. i was right, they lost by inception and a bad field goal. thank god, they left st. louis, when they did! Not the place to talk about the Super Bowl, Darkman. Please... this is for WOMEN's Sport. If there's a women's equivalent, then please let us know all about that. Do women play Gridiron over there..? Thanks dipping in with news about martial arts, Pat. Not my thing, but hey... sport is a wide canvas. Martial Arts aren't very big over here. Boxing perhaps, but that's about it. Nicola Adams became the first ever female boxing champion at London 2012 when the Flyweight Division was the first final to be contested. She successfully defended her title in Rio 2016. She's a lawyer by profession, but turned boxing professional in 2017 and is so far undefeated after 5 pro bouts. Nice. I will have to check her out. I hardly watch the super bowl, in general, rugby is like football in America. comparing to watching cricket that over 6 hours to play. you go into a coma watching it. at least, women allows to play rugby. professional American football - they never will allow women in football. stupid men will complain that women get away with more and men find out the women are better in football than they are. we can have, can we? It's a shame women aren't allowed to play Gridiron Football. Over here, if women are excluded from something it just makes us want to do it all the more and we sue the relevant sports governing body under Discrimination Law. And we win. I think women would be good at your football because it's as much a scientific sport as a physical one. It's like armoured chess and girls are smart. We could get our heads around the plays. I guess you have to grow up with cricket to love it. But once you do get into it, the game is fathomless in its ability to give you sheer pleasure from watching it. This is a men's world cup year and England are among the favourites to win. They have a high incentive as the men have never won their world cup, but the England women are the current world champions and have won the trophy on three previous occasions. The boys have got a bit of catching up to do..!! Cricket is taken very seriously in those countries that play it. Australia nearly broke off diplomatic relations with Britain once over a cricket series (sore losers) and the worlds biggest ever individual fan club (over 800'000'000 fans) belonged to Sachin Tendulkar, an Indian batsman. I love cricket although it's one of the sports I've never played. I'd like to see it become an Olympic sport. It certainly fulfills all the criteria and with the T20 version of the game now firmly established, it could be possible in the not too distant future. Hey, we tried to give them their own league, and the called it sexist. Women are allowed to play gridiron football. Her last race is on Sunday. I guess she crashed out earlier in the week and is sporting a shiner. England v Wales Rugby saturday..